After being lost at sea for four years, they washed up on a beach no worse for wear, housed in a waterproof container like a message in a bottle. 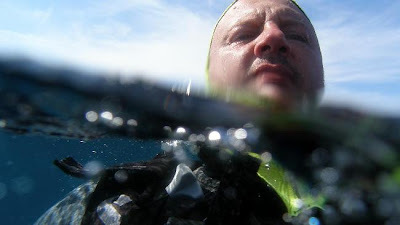 Only this wasn’t a bottle, it was a waterproof camera and “they” were photographs taken by divers who were lost and tossed at sea off the Australian coast -- on the same outing. Last Wednesday, The Daily Telegraph had the incredible story, which began on Dec. 23, 2006. Scuba divers Peter Trayhurn and Geoff Tosio found themselves lost at sea upon surfacing and finding their dive boat’s anchor line had snapped. The boat had drifted away, and they were left helplessly bobbing on the surface five miles off the coast, just north of Sydney. They spent more than four hours clinging together and fearing they’d never be found. Then, one of them decided to pass the time by taking photos. What better way to break the monotony (or thoughts about sharks)? “I thought, ‘This is a pretty interesting experience, I should take a few photos,’” Trayhurn told The Daily Telegraph. So he did. Fortunately, despite rough seas, the two were spotted by a tanker, rescued and returned to their drifting dive boat. Unfortunately, their dive boat capsized trying to navigate the treacherous swells of Wooli Bar at port. They were tossed overboard. They were lucky not to have lost their lives in the wild and Wooli waters of the Bar. The story isn’t clear how they finally reached safety. They probably swam in to shore. Later, the boat was salvaged, but the underwater camera was lost -- and had been lost for four years. Until a few weeks ago. Steve Campbell was walking his dog on One Tree Beach, a few miles north of Wooli Bar, and saw something sticking out of the sand. A camera. Campbell apparently had remembered the story of the lost camera and contacted Trayhurn, who was thrilled. “I didn’t really care about the camera or the housing, but getting those photos was special,” he told The Daily Telegraph. One of those photos (published in The Daily Telegraph) is shown above. You might think that is the end of the story. Well, it’s not. Turns out, Trayhurn is a man with nine lives. Incredibly, earlier this year he walked away without a scratch when he rolled his car in South Australia, and three weeks ago he underwent major surgery for bowel cancer. OK, now it’s the end of the story, one that ends happily ever after (and with photos).